Sometimes, good opportunities present themselves in strange ways. In this case, it was a midday text from my wife, Tasha. She explained that Ignatius Press had posted something on their Facebook page about wanting Catholic bloggers to review an eBook of one of their newest novels. 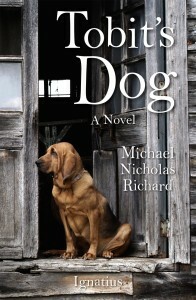 A few emails later, I received my review copy of Michael Nicholas Richard’s Tobit’s Dog. Since my wife and I basically share an Amazon Account for our Kindle devices, Ignatius is going to get a bonus second review from her. She was a bit ahead of me on this effort, and had reviewed and re-read the book of Tobit prior to reading the novel. Upon hearing this, I decided explicitly NOT to review the Bible prior to reading the book so I could approach this story from a different perspective. I’ll lead off with my clunky words and leave you with her elegant and edifying account to close with. This novel is set in the South during Depression-times. In this story, Tobit Messager is cast as black men of modest means and the story centers around his son Tobias’s quest to collect a debt from a distant relation. Tobias is accompanied by a long-lost cousin named Ace Redbone, who seems to have a knack for staying out of trouble in such a tumultuous setting. Despite taking a painfully long time to get going, the establishment of the setting and the depth of the characters was very profound in this book. The author does an excellent job of telling this story in a way that feels very natural. The more providential and miraculous aspects of the story happen in very organic ways. Tobit is made to suffer in a way that a poor black family in the South might have suffered in North Carolina prior to World War II. Tobias and Ace decide to travel carefully due to the tension between the races at the time. Folk superstitions were used to evoke the original Bible narrative concerning Sarah’s tribulations. I was excited to see parts of the storyline weaving together and the Tobias/Sarah relationship was beautifully done. My favorite part of the entire story was the interplay between Tobit’s dog, Okra, and his long-lost distant cousin Ace Redbone. There were several surprising moments where the author uses these two characters to pull back the veil to let you glimpse how God’s hand is at work. Ace Redbone was hands-down the most compelling character in the story for me. The way his affable charm and savvy navigated Tobias through his trek was inspirational, and it was done in a light handed and surprising way. Ultimately, what begins as a sad and depressing story for Tobit ends in a wonderfully crafted narrative of how God can bless through adversity and how one man’s life can ripple out to affect others. I became very invested in the characters by the end and was very relieved to see the words “Epilogue” near the end… which provided excellent closure and a few more of those wonderful illustrative moments showing God’s hand at work. I can provide a small warning to the reader: give this story at least three chapters to get going. I found the opening of the book slow, and the initial character establishment somewhat difficult to get through. By chapter four, the threads of the story are beginning to mesh in an interesting way and it really becomes great after that point. The author sometimes repeats aspects of a characters mannerisms or personality in a way that becomes unnecessary after the midway point through the book. That being said, I can honestly say that I enjoyed this book. I have found myself thinking about this story in the days since finishing the book, leaving me to ponder the ways that God may be testing me through adversity. It truly enlivened the Old Testament characters and made me excited to reread the Book of Tobit. I feel this story reinforced that there are really no coincidences, trials can also be blessings, and to never underestimate the power of God to bring good out of adversity. It is a powerful and true message. Before reading Tobit’s Dog, I read the Old Testament Book of Tobit; I wanted to be familiar with the story before reading the novel. I found Tobit’s Dog to be a wonderful retelling of the Book of Tobit. Because it’s a retelling, there are differences to some of the plot elements; these differences are minor and really help the story development in the novel. Variations aside, at its heart, this is a story about being true to your faith in God despite adversity. Changing Tobit the Israelite living in exile in Nineveh to Tobit Messenger living in North Carolina during the Depression perfectly emphasizes that Tobit is an outsider living in an hostile land. A man of faith, Tobit always tries to do what’s right, even when he knows it will bring him trouble. And when he finds himself blinded, he still lives his faith in his actions and with his words. As we might expect, though, being blinded is a trial for Tobit, and he prays to God for release, to die instead of living in misery. At the same time (and true to the Book of Tobit), Sarah is praying to God for the release of death to free her from her own difficult situation: her three fiancés have all died mysteriously and everyone considers her to be cursed. Tobit is visited by a previously-unknown cousin, Ace Redbone. Ace brings news of an old acquaintance who owes Tobit money, and Ace convinces Tobit to send his son, Tobias, to collect the debt. So Ace and Tobias, accompanied by Tobit’s dog, Okra, embark on the journey. Along the journey, Ace offers Tobias advice to help both Sarah and Tobit. Some elements of the story vary from the Book of Tobit, but the end results are the same: Sarah is freed of her curse, and Tobit’s eyes are healed. God has answered their prayers, not in the way they requested but according to His will. I found the first chapter of Tobit’s Dog to be a little tedious as the characters and background are established. After that, the pace of the story picked up, and I was easily immersed. Best of all, I loved reading this novel and comparing the story elements to the Book of Tobit. Without giving too much away, I want to share my thoughts on three of my favorite elements of the novel. The story of the catfish was beautifully adapted to fit the novel’s setting without removing the essential plot development. The snippets about Ace Redbone were perfectly timed in the story to help us better understand him and the essential role he played. And true to the Book of Tobit, the plot lines intersect to show how God answers prayers by bringing together those who need help and those who can provide it. You can buy the print or electronic editions of Tobit’s Dog at Ignatius Press. Aside from receiving a free review copy of this book, we were not compensated for this review. Special thanks to Rose from Ignatius Press for letting us take part in this fun opportunity. This entry was posted in Reviews and tagged ebook, reviews, tobit. Bookmark the permalink. Heading to the 2014 Catholic Answers National Conference!